Added ability to display tooltip (docs). Added align attribute to minimal geometry (docs). Added skin loading time logging to foobar2000 console. Skin's name for preferences page is taken from skin.xml now, rather than from directory's name. Added skin's author's name to the skin list. Disabled foo_title window dragging when the mouse is over button layer, thus preventing accidental button presses. Preferences page now displays only folders containing skin.xml. FYI: I've updated documentation on the wiki ( http://wiki.hydrogenaud.io/index.php?title=Foobar2000:0.9_Titlebar_(foo_title) ), so it should be a little bit easier to find various info on component usage and it's features. Fixed crash on exit from foobar2000. Added >>gallery<< showcasing stock and user-created skins. Updated various user-created skins for v1.0.0 (see git directory). Added 'speed' property to animation (see docs). Greatly reduced CPU usage: now UI is redrawn only on request and won't be redrawn if there is nothing to do. Renamed "Update Interval" in Preferences to "Maximum refresh rate" to better reflect it's new meaning. Skin list loading is now asynchronous. Tweaked skin list for cleaner look. Fixed bug: foo_title might move beyond screen borders, when changing to skin with different anchor position. Fixed bug: inconsistent fade-out animation when mouse is leaving foo_title. Added 'clip' property to skin element: set to false to disable clipping (see docs). Added 'no-content' layer type: this layer has no contents itself and is used solely for positioning other layers, it is also transparent for tool-tip layer detection (see docs). Fixed tool-tip behavior on complex skins. Fixed 'minimal' type geometry behavior on complex skins. Fixed error that prevented the filling of the skin list, when one of the skins is not parsable. Fixed clipping not being applied. Nice to see someone else still developing this plugin! I have also been using it all the while, but have recently found that it broke partially on Windows 10 resolution scaling screens (such as most modern laptops). The font size gets scaled but the window size does not, making the skins look terrible. I am on Windows 10 and have .NET 4.5 installed (along with the .NET 2.0,3.0 and 3.5 from the old foo_title. ) Do you have any idea what else I can do to fix it, such as a debug version or debug log that I should look at? I'm guessing that it's some old part of foo_title that is interfering with the install? FWIW, the plugin does work on a FB2k fresh install on a different computer, so it's almost certainly something on my laptop that's causing the issue. Looks like it needs VS2015 C++ redist (x86). @mindtempest I've never tried running foo_title with different resolution scalings, but I will look into it. @marc2003 Yes, you are right, I should've added it to installation instructions. If it won't bloat component size by much though, I'll just use the static run-time next release. Thanks, that was exactly what was needed! @TheQwertiest , thanks for the work so far! The mismatch in album art (and the inability to display embedded art) was pretty annoying, so thanks so much for fixing that! I guess implementing proper scaling in a plugin with so many moving parts is a nontrivial issue (if what happened after Apple decided to implement Retina displays on iPhones is any indication). For one, all of the bitmaps are going to be messed up by the scaling (I used raster art for my skins' buttons), and would likely have to be moved to some kind of vector drawing system in order to work properly with scaling. I'd guess that allowing the scale variable to be passed to the skin would allow for the best performance, since the skin author would then be able to handle it themselves (perhaps with multiple sets of raster art). Also, the issue can be addressed (albeit in a sub-par manner) by allowing a flag for the font to not scale as per the system's scaling settings. The mismatch in album art (and the inability to display embedded art) was pretty annoying, so thanks so much for fixing that! I would rather say built-in DPI support (i.e. without rewriting the skins) is impossible without creating some cumbersome and non-intuitive logic. They shouldn't be: in the worst case they just will be stretched (if the original image size was too small). I'd guess that allowing the scale variable to be passed to the skin would allow for the best performance, since the skin author would then be able to handle it themselves (perhaps with multiple sets of raster art). It will require some sort of math engine to make calculations and some way to pass the DPI/scale value. I had some thoughts about adding simple math engine not so long ago, so I might do it some time in the future. Also, the issue can be addressed (albeit in a sub-par manner) by allowing a flag for the font to not scale as per the system's scaling settings. Heh, that's exactly what I've done, actually. I will release a version with fix after I sort out the problem with preferences page on high-DPI screens. Yeah, exactly. If you've used a Retina iPhone in the time when the App Store's apps were still transitioning to support the new phones, you would see exactly that: stretched images. They looked horrible next to the crisp fonts and vector art since they were at the wrong resolution and were stretched to fit. I guess in the larger scheme of things it's a minor concern, but I'd prefer for that not to happen, especially since it's 2017. Added 'scaleable' attribute to text layers (see docs). Text is not scaled with DPI by default now, thus preserving skins, that are not compatible with scaling, from breaking on high DPI screens. Fixed preferences page being cut-off, when resolution scaling is above 100%. [!] Reuploaded 1.0.1 version: now it displays text layer correctly. Fixed version's build number is 1.0.1.34648. How can I check the version of foo_title? The version of foo_managed_wrapper.dll (0.7.1) is the same. foo_title: the actual implementation of foo_title popup, where all the (C#) magic lies. It is loaded through foo_managed_wrapper and not directly via foobar2000 components interface. 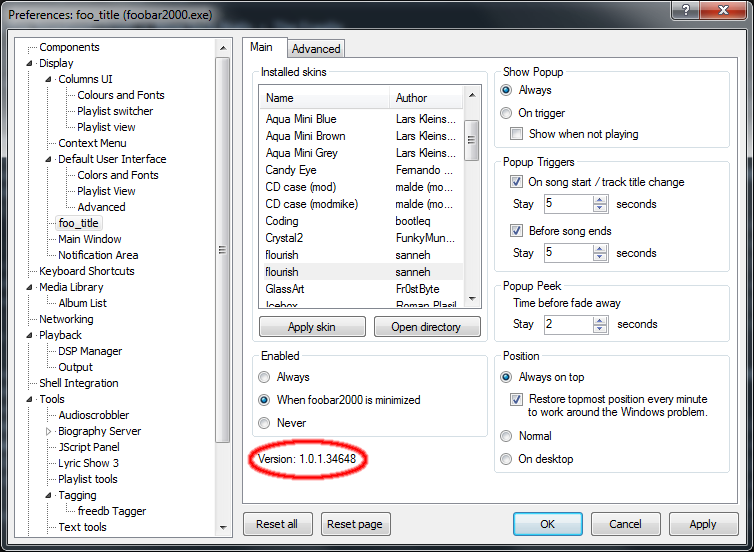 It's version is displayed in the bottom left corner of foo_title preferences (Preferences -> Display -> foo_title -> Main). Added foo_title to Preferences -> Components menu. Thus it's possible to view foo_title's version from the same menu as other components. Updated flourish skin (git directory). Fixed bug: 'enable when minimized' was not working at all. Fixed inconsistent fade-in/fade-out animations (hopefully for the last time). Added 'persistent' attribute to layer (see docs). Added animated .gif support to 'absolute-images' layer. Updated Milk Plate skin to make use of new 'persistent' attribute: now the panel's state is persistent across fb2k launches. Updated White skin to make use of .gif support. Added in-built DPI scaling, which is enabled by default (see docs). Removed 'scaleable' attribute from text layer. Fixed bug: preferences changes were not always reverted, when exiting without applying those changes. Fixed text truncation when DPI scaling is enabled. Fixed invalid height of the default text in flourish skin (link). PS: foo_title version can be checked in Preferences > Components > foo_title. Rebuilt with the latest fb2k SDK (2018-02-05). This also fixed some crashes in foo_title on fb2k exit. Also while I'm here, if you are open to feature requests, an option under foo_title 'Enabled' preferences for "Show and hide with foobar" would be handy. The scenario being I was thinking of using it as an overlay to the DUI to fancy it up some. I've had quite the fun messing around with this component, lots of possibilities.